This short article will give you an introductory understanding of assessment centres. What they are, why they’re used and how you should begin to prepare. 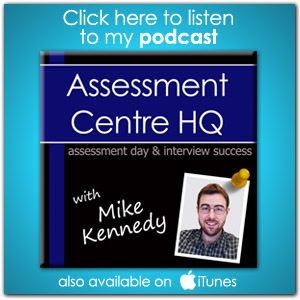 You can listen to our podcast episode on what to expect at your assessment centre here. You can practise the actual aptitude tests that employers use here and here. Interviews are stressful, but a full assessment event is one of the most challenging and intimidating things you will face in your career; it’s a full and rigorous test of your professional & mental ability. It’s not for the faint-hearted and if you are about to attend your first assessment event you will be genuinely surprised by how exhausted you feel afterwards. But don’t worry, we’re going to give you all the tools and advice you need to succeed. Assessment events are referred to by various names, sometimes they’re called “assessment centres”, “assessment days” or “assessment events”. The language may differ but the principle is exactly the same: It’s an event to test a group of candidates’ suitability for a given role. If you’re reading this then we assume you’ll be attending one soon (or hoping to attend one soon), so let’s look at what to expect in more detail. So what is an assessment centre? It’s not a location, it’s a process. It usually takes place at a company office, conference facility or a conveniently placed hotel. It’s basically a big, in-depth interview process for several people. FACT: An average corporate employee in the UK will attend 3 assessment centres during their career. So what happens at an assessment centre? Assessors observe a group of candidates performing a variety of specially-designed tests (including psychometric tests) and exercises which provide specific information on the ability & mental capacity of each candidate. Each of the exercises simulate aspects of the job description and work environment for the vacant role and allow the candidates to demonstrate how their skills match with those required to perform that role. It’s an efficient way for big companies to quickly sort the wheat from the chaff and that’s why assessment centres have become so widely used. 68% of employers in the UK and 72% in the US now use some form of assessment centre as part of their recruitment/promotion process. How long do assessment centres last? It varies from half-a-day to two full days. The more senior the role, the longer the assessment. Stop worrying! 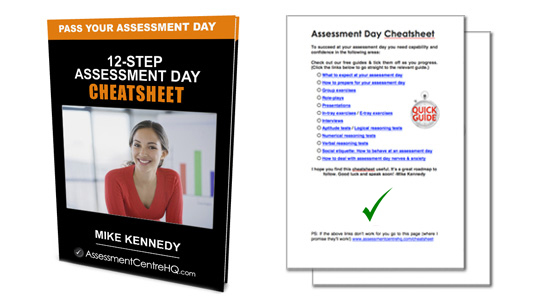 Download a 12-step assessment day cheatsheet & be perfectly prepared. Usually they will be a mix of HR consultants (in-house & external) and line managers and people at least one level above the position you have applied for. Typically they will be ambitious and successful people who understand the qualities they expect to see in an individual performing the role you have applied for. Candidates attending an assessment centre will usually be welcomed with tea and coffee and there’ll be an arrival period of 30 minutes or so when candidates and assessors will mill around outside and chat ahead of the day’s events getting underway. You’ll then be ushered into a communal ‘welcome briefing’ of some kind and you’ll receive an initial address together with the other candidates about the timing of the tests and exercises, location of rooms and housekeeping rules (fire alarms, washrooms etc). And without further ado the assessment exercises will begin. What exercises will I have to do? Some industries also run other ‘reasoning’ tests such as Inductive, Mechanical or Spatial reasoning, which are essential for engineering & technical roles. What happens during each exercise? We’ll cover this with you in much more detail in each individual section, but briefly, during each test a group of observers will rate you on a range of predetermined criteria. At the end of each exercise the observers compare each candidate’s performance to reach a consensus on overall performance. 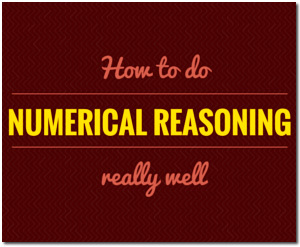 Do you have to take a numerical reasoning test or a verbal reasoning test? If so you may want to check out the aptitude tests section of the site. You can find practice tests and tons of free advice on every other type of ‘reasoning test’ too: numerical, verbal, abstract, logical, inductive, diagrammatic, spatial, mechanical comprehension, UKCAT and Watson-Glaser tests. 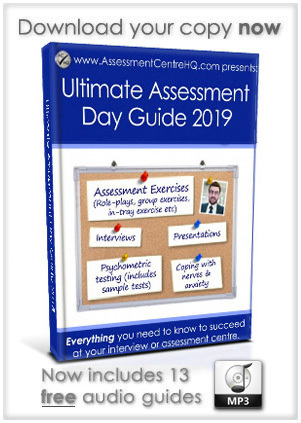 Worried about your assessment day? Maybe you’re worried about performing a presentation or preparing for an interview or group exercise or in-tray exercise? Perhaps you’d like some guidance on how to deal with nerves & anxiety at your interview? Lastly the Tools and Resources page is packed with useful equipment and ‘A’ List recommendations that will make your life easier. We hope you enjoyed reading this free article and wish you the best of luck at your assessment centre. 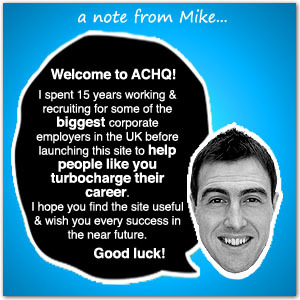 Turbocharge your employability & learn how to climb the ladder quickly.